"Chili peppers have been a part of the human diet in the Americas since at least 7500 BC. There is archaeological evidence at sites located in a tropical lowland area of southwestern Ecuador that chili peppers were domesticated more than 6000 years ago, the chilli grains show that peppers were among the oldest domesticated foods in the hemisphere and is one of the first cultivated crops in the Central and South Americas." Rich in Vitamin C, Vitamin A and antioxidants including B-carotene. Mineral dense in potassium, manganese, iron and magnesium. It is Capsaicin, the alkaline compound found in Chilli which gives them their strong, spicy taste. "Capsaicin has anti-bacterial, anti-carcinogenic, analgesic and anti-diabetic properties. Studies have found it can also reduce LDL cholesterol levels." O yeah, and ALCOHOL. Stout I went for this time. The Beermoth staff were brilliant. 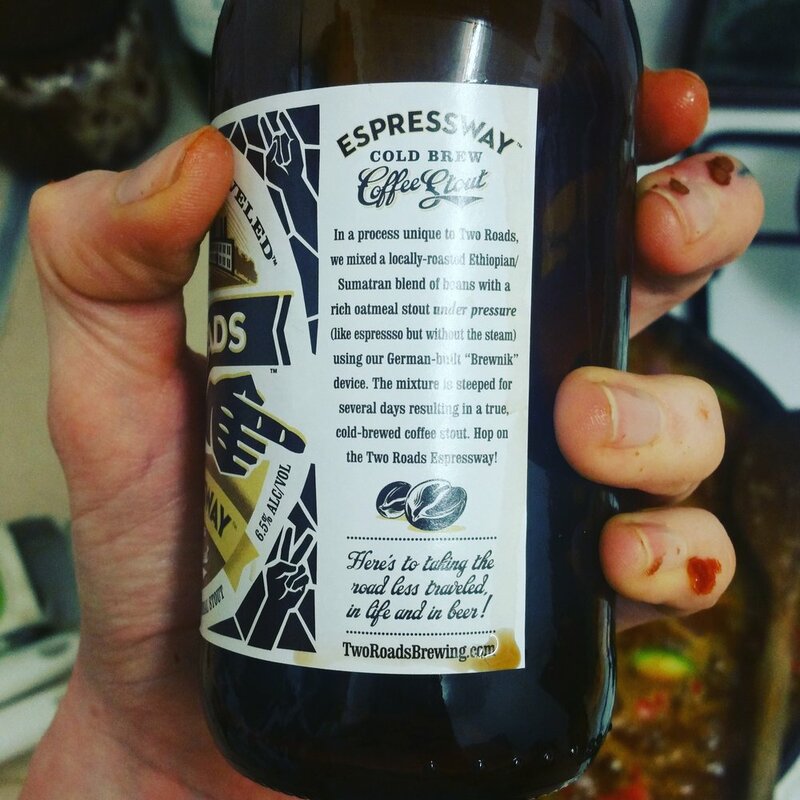 Found us this delicious Vegan Coffee Stout from Two Roads Brewing Company. Red wine will work a treat too. Soaking first before you get chopping your vegetables. 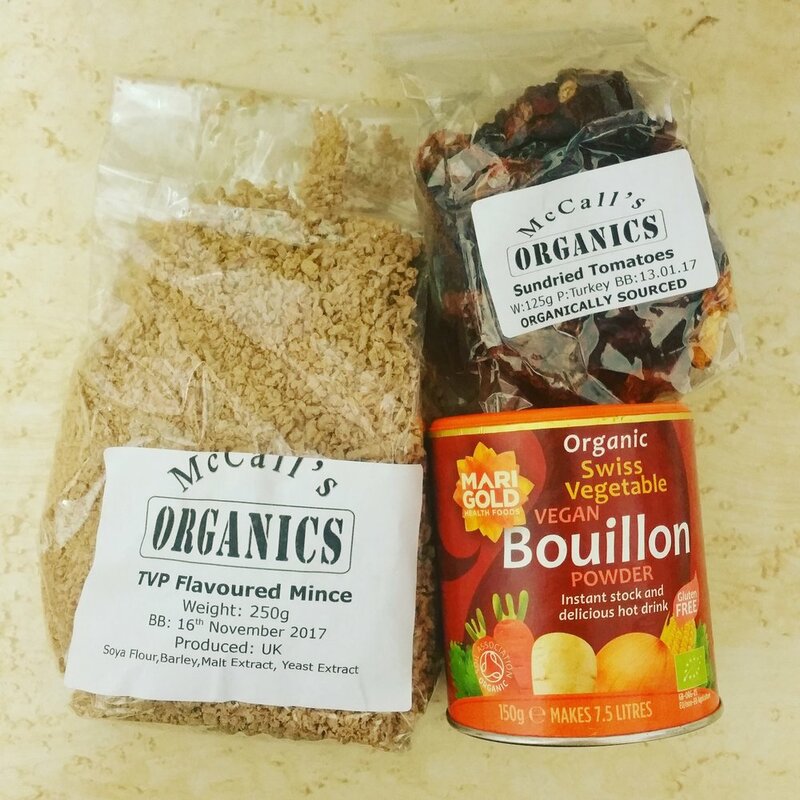 Get the sundried tomatoes in warm water in one bowl, and your TVP mince in another with the Swiss Bouillon (or your stock of choice). In a large pan fry the onions, garlic and chilli for a few minutes until the onions start to soften. Add the smoked paprika, cumin and cinnamon, stir for 1-2 minutes. Then add your courgette, peppers and mushrooms. Stir continuously for a couple more minutes then add your tin of chopped tomatoes. Reduce the heat to a simmer and after about 10 minutes add the strained TVP mince and sundried tomatoes and the liquid smoke. Add your bottle of stout/glass of red wine! Watch it bubble away. Let everything simmer for about 20 minutes, then add the jalapenos and brine. Stir in. Add your spinach last, you want it to stay bright green and keep all the goodness. Salt and pepper to your liking and you're ready to serve. Guacemole and Tomato Salsa are standard. Rice or wrap it's up to you. Nachos. Tacos. Huevos Rancheros made with the leftovers on a Sunday morning.